An implementation of WritableBinaryStream which can write at its end causing the underlying data to grow. This class owns the underlying data. Definition at line 135 of file BinaryByteStream.h. Definition at line 141 of file BinaryByteStream.h. Definition at line 144 of file BinaryByteStream.h. Definition at line 193 of file BinaryByteStream.h. Definition at line 200 of file BinaryByteStream.h. Definition at line 146 of file BinaryByteStream.h. Definition at line 196 of file BinaryByteStream.h. Definition at line 170 of file BinaryByteStream.h. Definition at line 157 of file BinaryByteStream.h. 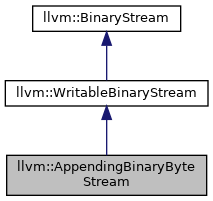 Given an offset into the stream and a number of bytes, attempt to read the bytes and set the output ArrayRef to point to data owned by the stream. Definition at line 148 of file BinaryByteStream.h. References llvm::makeArrayRef(), llvm::ArrayRef< T >::size(), and llvm::Error::success(). Definition at line 161 of file BinaryByteStream.h. This will always necessitate a copy. Cannot shrink or grow the stream, only writes into existing allocated space. Definition at line 172 of file BinaryByteStream.h. References llvm::ArrayRef< T >::data(), llvm::ArrayRef< T >::empty(), llvm::BinaryByteStream::getLength(), llvm::invalid_offset, llvm::ArrayRef< T >::size(), and llvm::Error::success().